This is my favourite length. It includes all the best bits of the day including live audio from the wedding formalities. It is edited using a time-shift editing style to 3 – 4 songs chosen by you. Please have a look through my packages and what I offer. If you are keen or have any questions please contact me. Not sure how many hours coverage you need? Only available for selected dates. Want to add more or customise your package? It is edited using a time-shift editing style. 5 – 8 songs chosen by you. Check to see if I’m available. If your date has nothing written on it chances are I am available. If so contact me or build your own package. 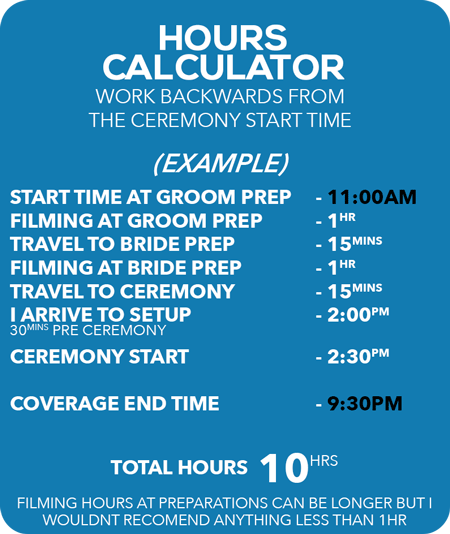 Looking for my wedding video packages? Submit your email address and you can get access to my wedding video packages.